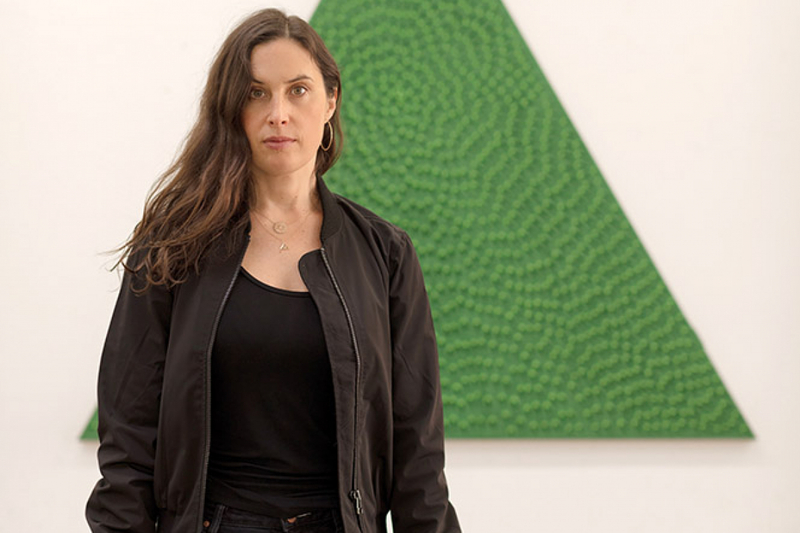 It’s not enough to be a great artist nowadays – just ask Jennifer Guidi (or not). Christina Ko takes a look at the sand-painter whose work is causing a ruckus in collector circles around the world. If you Google Jennifer Guidi, the first article that pops up is titled “If another person asks me to get them a Jen Guidi I think I might just vomit in my bed’: the next must-have market darling has emerged”. The Artnews piece was quoting art collector/advisor/curator Stefan Simchowitz, who sensationalised the recent hot streak this LA artist was on by pouring vitriol on bandwagon-jumpers looking to buy and flip Guidi’s work. “I am sick of you and I am sure Jen is as well,” he continued. Talk of market manipulation always arouses great interest, and Guidi’s work is particularly interesting in this context. More often than not, artists try to divorce themselves (or at least, so they say) from the process of buying and selling, but the fact remains: the people who collect your art have a great say in how you are critically perceived. And Guidi’s work is very often and very much in the right hands: at the Hammer Museum, in the Rubell Family Collection, part of the Marciano Art Foundation. It’s been reported that at recent shows, buying was a two-for-one deal: in order to acquire one for yourself, you first had to purchase another and donate it to a museum. Has all this talk overshadowed the work? Guidi is certainly doing her best to diffuse the chatter in this area, avoiding questions that centre on the sales and the secondary market. Almost ironically, her pieces are ethereal, beautiful paintings created using sand and echoing the shapes of the mandala, born of Guidi’s meditative practice, which, one imagines, takes her far away from thoughts of commerce and reputation. “Meditation does feed how I make my work and the work in return feeds my meditation practice. I like to think of the energy that moves in and out of the work – in a similar way that I think when I am sitting and pulling in the energy of the universe and also giving as much back as I can. I believe that through repetition I am able to hyper-focus and get into the zone, which enables me to see new ideas,” she says. Before she started doing the sand paintings which are so popular now, Guidi was still a painter, albeit one whose work was a little less abstract. “I’d been thinking about using sand for years before I did,” she says. For her upcoming show at Gagosian in Hong Kong this month, Guidi will show 14 new paintings that are richer in bold, primary colours and harder-edged than her previous work. There will be “three mountain paintings, one sunset painting and six triangular paintings”, but all still offering the same zen-like quality and Californian hippie-trippy vibe that has become her calling card. As this is Hong Kong, the collector vultures will be more than ready to descend upon a newish name, one now endorsed by institutional and collector demand. It’s arguable that the Artnews article will only exacerbate the demand for Guidi pieces by trend followers (lucky side effect, or all part of some diabolical plan? ), leaving Guidi free to continue her own artistic exploration, blissfully estranged from the hullabaloo of market chatter. Which is how an artist should be able to work, anyway. It took Guidi decades to find her flow, and now that she’s in the groove, she’s going to keep doing what she does: creating.